Moro Long-term experiment (established in 2003) at the Oregon State University, Columbia Basin Agricultural Research Station, Moro, OR. Photo provided by Stephen Machado. Issue: Soil organic matter is a key indicator of soil health because of its influence on soil structure, aggregate stability, water infiltration, water holding capacity, soil biological activity, cation exchange capacity, and pH buffering and amelioration. Since cultivation began in the 1800s, up to 60% of soil organic matter has been lost from wheat–fallow lands of the Pacific Northwest (PNW). Soil organic matter has become depleted because of limited biomass production, which is due to low precipitation and fallowing every other year. Improving soil health by building up soil organic matter is necessary for enhancing crop productivity and sustainable agriculture. Action taken: We used data from the ongoing long-term experiments at the Oregon State University Columbia Basin Agricultural Research Center near Pendleton to study soil organic matter depletion and the effects of burning and nitrogen application. Results: We have over 80 years of data indicating that the predominant wheat–fallow cropping system depleted up to 63% of soil organic matter and 26% of nitrogen from the 0- to 60-centimeter soil depth profile when compared to an adjacent grass pasture, except where cattle manure was applied biennially at about 22 megagrams per hectare. Fall burning was most detrimental and depleted soil organic matter at the rate of 0.64 megagrams per hectare per year. Addition of up to 90 kilograms per hectare of nitrogen did not stop soil organic matter depletion in the wheat–fallow systems. Soil organic matter loss in treatments where pea vines were added back to the soil, although more than the loss under manure treatments, was less than under treatments receiving nitrogen. In another study that started in 1963, soil organic matter was maintained in wheat–pea cropping systems, particularly under reduced- and no-till systems. 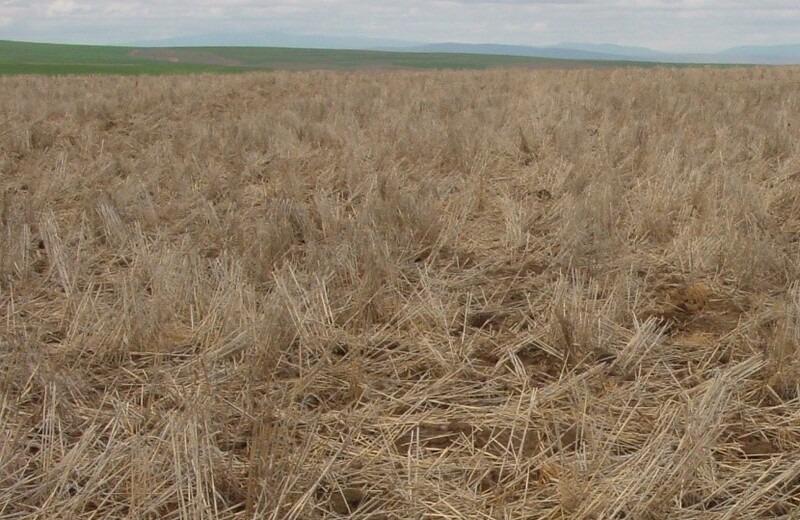 Reduction in tillage, application of low C:N ratio residues (e.g., pea vines), and elimination of burning can improve sustainability of winter wheat production in the summer-fallow region of the PNW. Bista, P., S. Machado, R. Ghimire, S. J. Del Grosso, and M. Reyes-Fox. 2016. Simulating soil organic carbon in a wheatfallow system using the Daycent Model. Agronomy Journal 108:2554-2565. Ghimire, R., and S. Machado. 2015. Long-term crop residue and nitrogen management effects on soil profile carbon and nitrogen in wheat–fallow systems. Agronomy Journal 107:2230–2240. Machado, S. 2011. Soil organic carbon dynamics in the Pendleton long-term experiments: Implications for biofuel production in Pacific Northwest. Agronomy Journal 103:253–260. Winter wheat-summer fallow rotation. Moro, OR. Photo provided by Stephen Machado. 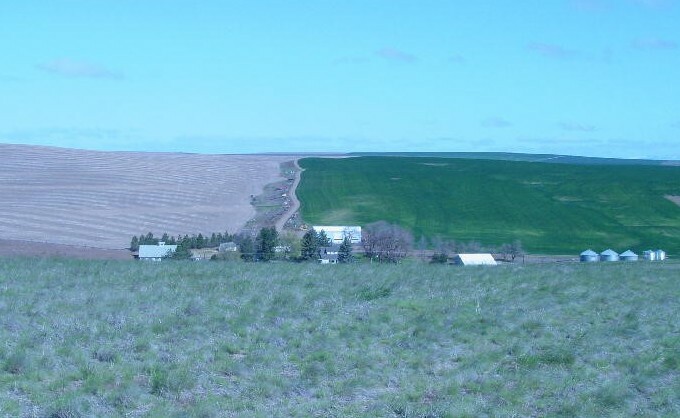 Issue: Annual cropping, necessary for soil organic matter maintenance or buildup, is difficult to implement in most parts of north-central OR and south-central WA, where annual precipitation is less than 280 millimeters. Most wheat growers in these regions are still practicing the traditional winter wheat–summer fallow rotation using some form of tillage. Previous studies have shown that this cropping system depletes soil organic matter, exacerbates soil erosion, and is not biologically sustainable. Some growers remain skeptical about alternative cropping systems such as the wheat–fallow system using no-till or chemical fallow that have the potential to alleviate the negative impacts of the traditional wheat–fallow system. Action taken: To inform growers transitioning from the traditional winter wheat–summer fallow system to no-till systems, we established a long-term experiment in the 2003–04 crop year to identify no-till fallow systems and annual cropping systems that could replace the traditional wheat–fallow system without sacrificing grain yield. After six years of study, average grain yields of winter wheat in the no-till winter wheat–chemical fallow rotation (3.43 megagrams per hectare) and winter wheat–spring barley–chemical fallow rotation (3.76 megagrams per hectare) were not significantly different from wheat grain yields under the traditional wheat–fallow rotation (3.56 megagrams per hectare). Notill fallow systems continued to yield more than traditional fallow systems in the 5-year period that followed. Water use efficiency was very similar among the three fallow systems. Results also show that no-till annual cropping of winter wheat, spring wheat, and barley, although risky, can be practiced in this region. Weeds were easier to control in the annual cropping rotation compared to other rotations. Results: Given the benefit of no-till systems to soil conservation, adoption of no-till winter wheat–chemical fallow or the more-intensified winter wheat–spring barley–chemical fallow rotation in place of the traditional winter wheat–summer fallow system is recommended. Annual cropping of spring wheat and spring barley under no-till is also recommended if deemed profitable. Annual cropping was observed to increase soil surface residues and soil organic matter, factors essential for enhancing grain yields, supporting agricultural sustainability, and developing climate-resilient cropping systems. Machado. S., L. Pritchett, and S. Petrie. 2015. No-tillage cropping systems can replace traditional summer fallow in north-central Oregon. Agronomy Journal 107:1863–1877. Smiley, R. W., S. Machado, J. A. Gourlie, L. C. Pritchett, G. P. Yan, and E. E. Jacobsen. 2013. Effects of crop rotations and tillage on Pratylenchus spp. in the semiarid Pacific Northwest United States. Plant Disease 97: 537-546. No-till field, Moro, OR. Photo provided by Stephen Machado. Issue: Soil organic matter is the foundation of healthy soil and agricultural sustainability. Changes in soil organic matter, however, often take more than 10 years to become evident, and by then considerable soil degradation may have occurred. At the Columbia Basin Agricultural Research Center, OR, it has taken between 20 and 80 years to see substantial changes in soil organic matter. The ability to predict management effects on soil organic matter dynamics, therefore, is a prerequisite to designing resilient and sustainable cropping systems under a changing climate. Action taken: Using data from an 80-year-old crop residue experiment, we used the DAYCENT model to predict trends in grain yield (r=0.93), residue yield (r=0.95), and soil organic matter (r=0.99) from 1931 to 2010. We then projected the effects of conventional tillage and no-till on soil organic matter into the future. Results: The model projected that conventionally tilled wheat–fallow systems, except where manure was added, would lose 866 to 2192 grams soil organic carbon per square meter (g C/m2) (58% of soil organic matter) between 1931 and 2080. The manure treatment would add 496 g C/m2 soil organic carbon during the same period. Conversion from current conventional tillage practices to no-till from 2011 onward, however, would minimize soil organic matter loss by 17% to 47% under different wheat–fallow systems. No-till conversion in addition to the manure treatment would increase soil organic matter by more than 300%. Adoption of a no-till system and the addition of organic amendments can improve the long-term sustainability of dryland wheat–fallow systems. Bista, P., S. Machado, R. Ghimire, S. J. Del Grosso, and M. Reyes-Fox. 2016. Simulating soil organic carbon in a wheat-fallow system using the Daycent model. Agronomy Journal 08:2554–2565. Prilled biochar from Walking Points Farms. Photo provided by Howard Boyte, CEO, Walking Point Farms LLC. Issue: Up to 60% of soil organic matter has been lost since the 1800s, when cultivation started in wheat–fallow lands of the Pacific Northwest. Soil organic matter has become depleted because of limited biomass production, which is due to low precipitation and fallowing every other year. In addition, the continued use of ammonium-based fertilizers has increased soil acidity to less than pH 5.0 in the top 15 centimeters of soil. Soil pH below 5.2 interferes with wheat growth, biomass production, and yield. Increased soil organic matter and favorable pH levels (pH 6 to 7) are essential for improved crop productivity and sustainable agriculture under a changing climate. Action taken: Biochar, charcoal produced from pyrolysis and resistant to decomposition, has the potential to improve soil health. Adding biochar to soil sequesters carbon that would otherwise be lost to the atmosphere as carbon dioxide through burning or natural decomposition, where it would contribute to global warming. We evaluated the effects of biochar derived from forest wastes on crop yields, soil pH, and nutrient dynamics. Biochar was applied to field plots under a winter wheat–spring pea rotation and to soil samples with or without fertilizer in a greenhouse experiment. Results: In the field, application of biochar increased grain yield, and the yield increase has persisted for three years even without further biochar applications. Biochar increased pH by 0.42 units (5.76 to 6.18) but did not influence other nutrients. In the greenhouse study, biochar increased wheat shoot biomass and root biomass as well as soil pH. Applying biochar to soil samples also increased phosphorus, potassium, and sulfur, but not nitrate and ammonium. Results indicate that biochar has the potential to increase crop yields from wheat and spring peas while sequestering carbon. Increasing pH may have increased nutrient use efficiency, resulting in higher crop yields. The positive effects from biochar have persisted for three years, and the study continues to monitor yield without any further applications of biochar. No-till winter canola planted into tall winter wheat stubble. Photo by Lauren Port. Issue: While it is recognized that water drives wheat nitrogen use efficiency (yield per nitrogen supply) in the inland Pacific Northwest (PNW), we had only a rudimentary understanding of how water influences the plant and soil components of single-crop and rotational nitrogen use efficiencies across diverse rotations. Evaluating key management variables such as cover cropping, tillage, and crop rotation will help identify best management practices that improve water and nitrogen use during increasing summer temperatures and moisture stress during climate change. Our goal is to identify win-win scenarios that meet producers’ short-term goals and develop long-term adaptation and mitigation strategies. Action taken: We coordinated eight crop-rotation trials across low-, intermediate-, and high-rainfall zones in the inland PNW to gain a better understanding of water- and nitrogen use efficiencies across crop sequences adapted to the soil andclimate conditions of each location. We established standardized methods for soil and plant sampling and analysis to assess crop sequential water- and nitrogen use efficiencies. Results: Our research illustrates the importance of nitrogen fertilizer carryover and subsequent uptake by spring wheat and spring pea and by winter wheat in three-year rotations. Furthermore, we developed methodology for assessing water and nitrogen use efficiencies across whole crop sequences, as opposed to the more typical single-crop assessment, and tested it on these and other regional rotational data. The basic methodology is being applied across REACCH study sites to evaluate relative nitrogen- and water-use efficiencies of conventional and alternative rotations across the region. Variables being compared include tillage and residue management, nitrogen fertilizer management, crop rotation, and recycling organic amendments. Maaz, T., and W. L. Pan. Residual fertilizer and crop sequence impact rotational N use efficiency. Agronomy Journal. In revision. Maaz, T. M., L. Port, W. L. Pan, W. Schillinger, I. Madsen, H. Collins, and A. Esser. 2015. Rotational nitrogen and water use efficiencies in intensified and diversified cropping systems across the precipitation gradient of Eastern WA. In: Climate Change and Cereal Production in Semi-Arid Regions of the World. REACCH International Conference Abstracts.Minneapolis, MN. Pan, W., D. Huggins, F. Young, B. Schillinger, A. Esser, S. Machado, J. Johnson-Maynard, T. Maaz, I. Madsen, L. Port, H. Collins, V. McCracken, K. Painter, K. Borrelli, E. Brooks, C. Stöckle, and S. Eigenbrode. Win-win cropping system strategies for farmers and climate change. Frontiers of Ecology and Environment. In preparation. Spreading biosolids on a wheat field in Douglas County, WA. Photo by Craig Cogger. Issue: Building soil organic matter levels in the inland Pacific Northwest has proven to be challenging in our traditional cropping systems. The one management factor linked to substantial soil organic matter increases, as documented in long-term trials at Pendleton, OR, is the addition of organic amendments such as animal manure. Action taken: We conducted a comprehensive review of biological soil amendment research. In addition, we analyzed soil samples from a 20-year experiment conducted near Okanogan, WA, where a wheat–fallow system has been fertilized with either King County, WA, biosolids or commercial anhydrous ammonia. We analyzed archived soil, plant, and biosolids samples to assess carbon and nitrogen balances in the system over 20 years. Results: Total soil organic carbon and nitrogen more than doubled over 20 years during biosolids application, while sufficiently fertilizing the wheat–fallow system. Anhydrous ammonia mostly contributed to grain nitrogen production. Gains in soil organic matter included stable organic matter fractions, providing further evidence that adding organic amendments like biosolids should be credited as an effective way to sequester carbon and reduce greenhouse gas emissions. Studies of long-term biosolids application on sequestration of carbon and nitrogen in other systems such as perennial grass pastures are continuing beyond REACCH. Pan, W. L., L. E. Port, Y. Xiao, A. I. Bary, and C. G. Cogger. Soil carbon and nitrogen fractionation and balances during longterm biosolids applications to semi-arid wheat-fallow. Soil Science Society of America Journal. Submitted. Yorgey, G., W. Pan, R. Awale, and S. Machado. Soil amendments research in dryland systems of the inland Pacific Northwest. In: Yorgey, G., and C. Kruger, (eds. ), Advances in Sustainable Dryland Farming in the Inland Pacific Northwest. Washington State University Extension. In press. Young, L., and B. Pan. 2015. 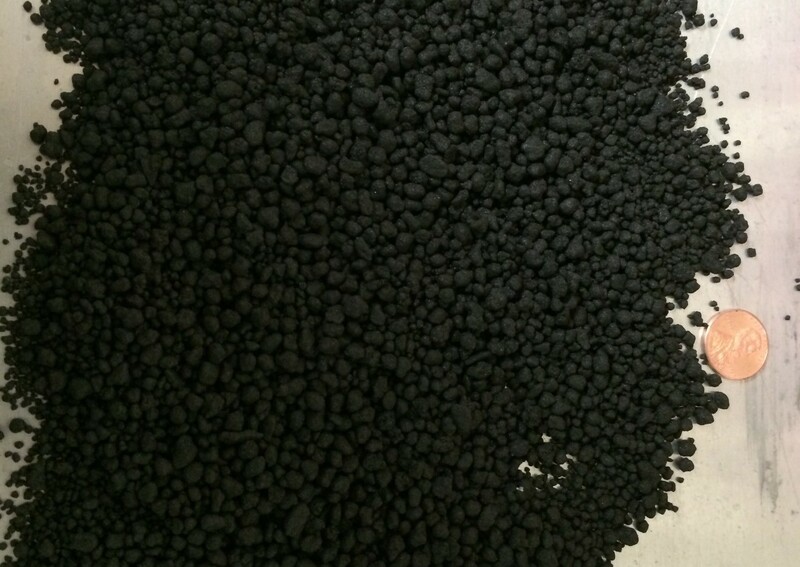 Soil carbon and nitrogen fractionation following biosolids application. In Borrelli et al. (eds. ), Regional Approaches to Climate Change for Northwest Agriculture: Climate Science Northwest Farmers Can Use. pp. 28–29. Total soil nitrogen (pounds per acre) at the 0- to 1-foot sampling depth in 2008 on the Cook Agronomy Farm. Georeferenced sampling locations are marked as black points, and gray lines are contour intervals (9.8 feet). 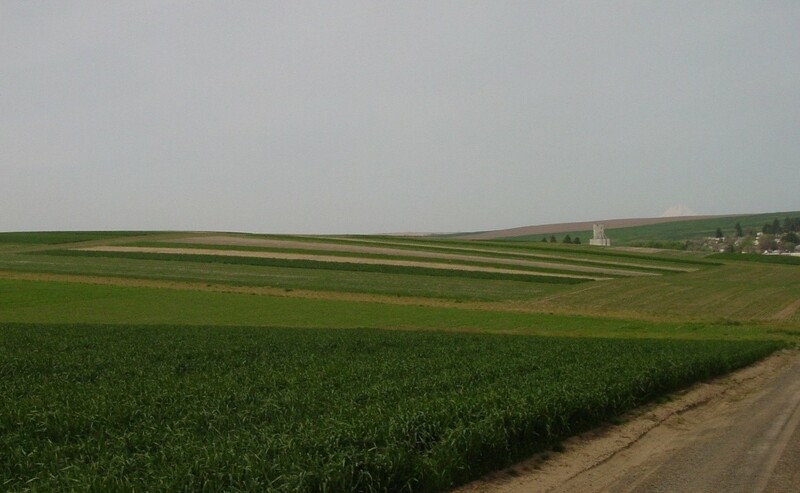 Field strips where different crop rotations were established are bounded by black lines. Issue: Assessing nitrogen use efficiency on a single-crop basis can underestimate the actual efficiency that can occur over the course of several crop rotations. This actual longer-term nitrogen use efficiency has rarely been quantified. Action taken: We assessed nitrogen use efficiency over the course of 10 years at the Cook Agronomy Farm at Pullman, WA, by monitoring initial soil nitrogen levels, amounts of nitrogen applied, removal of crop nitrogen at harvest, and final soil nitrogen levels. Results: We found that the conversion from conventional tillage to no-tillage increased soil profile nitrogen by 35 pounds per acre annually. This indicates that soil organic matter was increasing over this time period and that additional nitrogen inputs were needed as nitrogen is an important component of soil organic matter. The nitrogen use efficiency calculated for the longer-term cropping system ranged from 65 to 85%, about two times greater than what is typical for a single crop. This occurs because applied fertilizer nitrogen cycles through soil organic matter where it is stored and can be used by subsequent crops. Quantifying nitrogen use efficiency based on longer-term cropping system evaluations is an improved approach over singleyear assessments; however, long time periods are required, and errors associated with the measurements make accurate quantification problematic. Unger, R., D. E. Huggins. 2015. Cropping system nitrogen use efficiency after 10 years of no-tillage. In: Borrelli et al. (eds. ), Regional Approaches to Climate Change for Pacific Northwest Agriculture: Climate Science Northwest Farmers Can Use. pp. 62-63. Issue: The low- and intermediate-rainfall zones in the dryland cropping region of eastern WA often rely on a tillage-based, summer-fallow system to produce winter wheat. Yet reducing fallow and improving crop diversity are important to reduce erosion and improve long-term soil health. Action taken: The Washington State University Wilke Research and Extension Fam is a 320-acre direct-seeded facility located in the intermediate-rainfall zone. The farm has been divided into eight large plots (22 to 67 acres each). One plot is in a continuous crop rotation, three plots are in a 3-year rotation (no-till fallow–winter wheat–spring cereal), and four plots are in a 4-year rotation (no-till fallow–winter wheat–broadleaf crop–spring cereal). We collected agronomic and economic data each year comparing the performance of the three rotations. Results: There has been no difference in returns over production costs between the 3-year and 4-year rotations, and both of these rotations have outperformed the continuous crop rotation. Our findings have helped farmers stretch their rotations and reduce the overall amount of summer fallow and especially tillage-based summer fallow. Since the inception of this project, an estimated 25 farmers within a 20-mile radius of the farm have purchased direct-seed drills. These farms represent significant acreage under a no-till or direct-seed farming system. Esser, A. D., and D. P. Appel. 2015. WSU Wilke Research and Extension Farm production and economic performance 2013. Technical Bulletin TB02. Washington State University Extension. Esser, A. D., and D. P. Appel. 2015. WSU Wilke Research and Extension Farm production and economic performance 2014. Technical Bulletin TB03. Washington State University Extension. Esser, A. D., and D. P. Appel. 2016. WSU Wilke Research and Extension Farm production and economic performance 2015. Technical Bulletin TB20. Washington State University Extension. Esser, A. D., and D. P. Appel. WSU Wilke Research and Extension Farm production and economic performance 2016. Washington State University Extension. Technical Bulletin. Submitted. Issue: Wheat farmers traditionally make fertilization decisions based on their previous application history and, secondarily, on soil sample data. Few wheat farmers have known how to predict nitrogen fertilizer needs based on their previous crop production and nitrogen use efficiency. Action taken: We developed a decision tool for nitrogen fertilization using Washington State University (WSU) Extension Bulletin EB1987E. The WSU Post Harvest Nitrogen Efficiency Calculator allows wheat farmers to improve their nitrogen application program based on nitrogen use efficiency data. Results: In combination with multiple extension outreach presentations, the calculator has improved growers’ understanding of wheat fertilization based on the quantity of nutrients applied prior to harvest and the quantity of nutrients removed from the field at harvest. Grower surveys determined that between 25% and 71% of growers are utilizing nitrogen use efficiency to make nitrogen fertilization decisions on their farms. This finding has been reaffirmed through verbal conversations with local grain elevators where farmers have specifically requested grain protein be reported on their settlement sheets. Soil organic carbon (SOC) and total nitrogen (N) levels and their relationship to mean average temperature (MAT)/mean average precipitation (MAP) × 0.01 at present and under future climate scenarios for 2050 and 2100 across four dryland sites. Issue: Predicted future climate scenarios for the inland Pacific Northwest (PNW), including warmer temperatures relative to precipitation levels, could negatively impact soil organic matter and associated soil health. Action taken: Using long-term experiments throughout the dryland cropping region of the inland PNW, we assessed the relationship between soil organic carbon and the climate ratio—mean annual temperature divided by mean annual precipitation—as well as cropping intensity and soil disturbance. We alsocalculated future projections of the climate ratio to assess climate change impacts on soil organic carbon. Results: We discovered a strong relationship between soil organic carbon and the climate ratio, where soil organic carbon declines as the climate ratio increases. The climate ratio was the dominant driver of soil organic carbon compared to both cropping system intensity and soil disturbance. Using future climate projections, we calculated that the climate ratio would increase throughout the region in response to climate change. Therefore, climate change could reduce overall soil organic carbon levels throughout the region. If this occurs, future soil health within the region would also decline. Morrow, J. G., D. R. Huggins, and J. P. Reganold. Climate change predicted to negatively influence surface soil organic matter of dryland cropping systems in the inland Pacific Northwest, USA. Frontiers in Ecology and Evolution. In review. Issue: Monitoring soil health is an important component of any land management system and is likewise important for assessing agricultural sustainability. Currently, soil health assessments are expanding to consider more biological measures of soil health in addition to chemical and physical measurements. However, the utility of new soil health measurements needs to be assessed for the inland Pacific Northwest (PNW). Action taken: We measured soil biological, chemical, and physical properties at long-term experiments throughout the dryland cropping region of the inland PNW. We evaluated these soil health metrics using the following seven criteria as a framework to judge their effectiveness: (1) evidence based, (2) sensitive to change, (3) logistically feasible, (4) cost effective, (5) accurate and precise, (6) performance, and (7) valued for management decisions. Results: We found that biological measurements were much more variable than chemical and physical measurements, and in some cases were not sensitive enough to distinguish differences between long-term management practices such as no-tillage and cropping system intensification. Consequently, biological tests as well as other new tests need to be carefully assessed to determine their usefulness as soil health measurements. Based on our seven criteria to gauge soil health metrics, permanganate oxidizable carbon scored the highest and should be considered for soil health assessments in the inland PNW. Morrow, J. G., D. R. Huggins, L. A. Carpenter-Boggs, and J. P. Reganold. 2016. Evaluating measures to assess soil health in long-term agroecosystem trials. Soil Science Society of America Journal 80(2): 450-462. No-till management positively impacts active soil carbon levels at the surface, thereby improving soil health. Photo by Fred McClellan. Issue: Conversion of native lands to agricultural production has resulted in losses of soil organic carbon ranging from 20% to 60% within 40 to 50 years. Although adoption of practices such as conservation tillage, intensification of cropping, and application of organic amendments can at least partially restore soil organic carbon levels, knowledge of how much soil organic carbon restoration can be achieved is lacking. In addition, past research has indicated that soil organic carbon variability within a given field may be tremendous and needs to be considered when assessing soil organic carbon responses to changes in management. Action taken: We used past studies and existing research to quantify expected soil profile changes in soil organic carbon that would likely occur under different management scenarios. In addition, we assessed the within-field variability of soil organic carbon at the Washington State University Cook Agronomy Farm at Pullman, WA. Results: We developed probability functions of changes in soil organic carbon that would occur under different management scenarios for each agroecological zone. We found that withinfield soil organic carbon was extremely variable, with differences ranging from two to three-fold, and that subsoil levels of soil organic carbon were significant and greater than topsoil levels of soil organic carbon in some locations. Brown, T. T., and D. R. Huggins. 2012. Soil carbon sequestration in the dryland cropping region of the Pacific Northwest. Journal of Soil and Water Conservation 67(5): 406–415.